"You got her? Did you get her good? Slap me five! I got one too! A bonus body! Look at that beef!" Tobe Hooper changed the face of horror forever in 1974 with his gory, disturbingly over-the-top masterpiece, The Texas Chainsaw Massacre. A dozen years later, he revisited the scene of his crime in this even more deranged sequel. It's not just a retread, however. Where the first film went for pure terror, the sequel goes for the sick laugh every time. Important Safety Tip No. 1: Don't play chicken with a family of deranged, chainsaw-wielding maniacs. This rule is especially important if one of them is wearing someone else's face as a mask. The film starts off with a bang as two joyriding kids violate this important safety tip, although to their credit they don't actually know that the oncoming pickup truck is full of deranged chainsaw-wielding maniacs, including the infamous Leatherface of the first film. The joyriders happen to be on the car phone harassing a nighttime female DJ, Stretch (Caroline Williams). The ensuing mayhem when the joyriders get theirs is caught on tape at the radio station. Since pickup trucks full of deranged chainsaw-wielding maniacs are apparently par for the course in Texas, the local police don't seem to notice much of anything out of the ordinary in the accident scene. The fact the top of one of the kids' heads is sawed off registers only as the work of pranksters. Only deputy Lefty Enright (Dennis Hopper) connects this with the string of chainsaw killings and disappearances in north Texas. It's a bad sign when Dennis Hopper is playing your sane guy. Then again, he might not be quite all there either, since one of the victims from the original movie happens to be his nephew, and Enright is on a mission of vengeance. At first, Stretch's offers to play the audio tape for Enright are rebuffed, apparently because Enright has a thing about accepting assistance from witnesses. Suddenly he gets the bright idea to have her play the tape over the air to see what happens. Stretch is apparently not all there either, because she agrees. The chainsaw clan hears the broadcast, and predictably, all hell breaks loose at the radio station. Important Safety Rule No. 2: If a family of deranged chainsaw-wielding maniacs for some reason lets you live, it is not a good idea to attempt to follow them back to their lair. Stretch immediately violates this rule and the second half of the movie concerns Enright's efforts to save her before she ends up as part of the family's prize-winning chili, scheduled to be served at the Texas football game the next day. This leads me to Important Safety Rule No. 3: Never eat chili at a stand called The Last Roundup. Yikes! 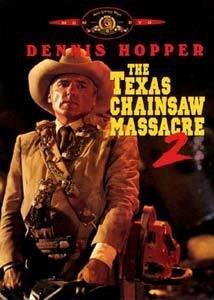 The highlight of the film is an uproarious battle with chainsaws between Leatherface and Enright. However, the sexual chainsaw tango which Leatherface plays with Stretch (who spend the entire film in hot pants) is a close second. Back at the lair, the whole sick and twisted family is present, included the beloved Grandpa from the first film. There's also a new addition: the grisly Grandma of this bunch. We also get a little backstory about how the family ended up with its bizarre practices. The film is full of vicious, sick humor of every kind. Hooper clearly has an adolescent brain full of weird foolishness to serve up in his films. Accordingly, I found myself laughing throughout the movie. There is also plenty of gore, though much of it is played for laughs. Taking this movie seriously, as the keepcase and the trailer suggest, would be a major mistake. This is a raucous and funny black comedy that has a lot of fun with ridiculous horror movie conventions. Image Transfer Review: The image on the non-anamorphic picture is actually pretty good. Blacks are solid and colors are decent, with little in the way of chroma noise. The film tends to be a little grainy in places but this appears to be an issue related to the low-budget origins of this film. Shadow detail is pretty good as well. The source print is in excellent condition, with only a handful of slight speckling to be seen as defects. The fullscreen side of the disc contains a pan-&-scan transfer; significant picture information is lost on both sides from this version. Audio Transfer Review: The Dolby Surround track features a fair amount of directionality, although dialogue is almost entirely center-oriented. No distortion was heard in dialogue or music. The racket of the chainsaws comes through loud and clear from all speakers, although I often was longing for an LFE track to really give it some oomph. Extras Review: The disc really falls down on extras. MGM provides a trailer (presented in widescreen on the widescreen side), and that's about it. Perhaps MGM heard people complaining about the "collectible booklets" that MGM often touts as an extra, because no such booklet is included here. We get no English subtitles, although French and Spanish subtitles are provided. The chaptering is however quite generous. A very funny, but quite gory, black comedy. Recommended for those who have a strong stomach and a sick sense of humor. Just remember the important safety rules and everyone will be fine.